Make up your room, but make sure to explore the other rooms as well. Get ready to experience a new way to enjoy a virtual world – in voxel! 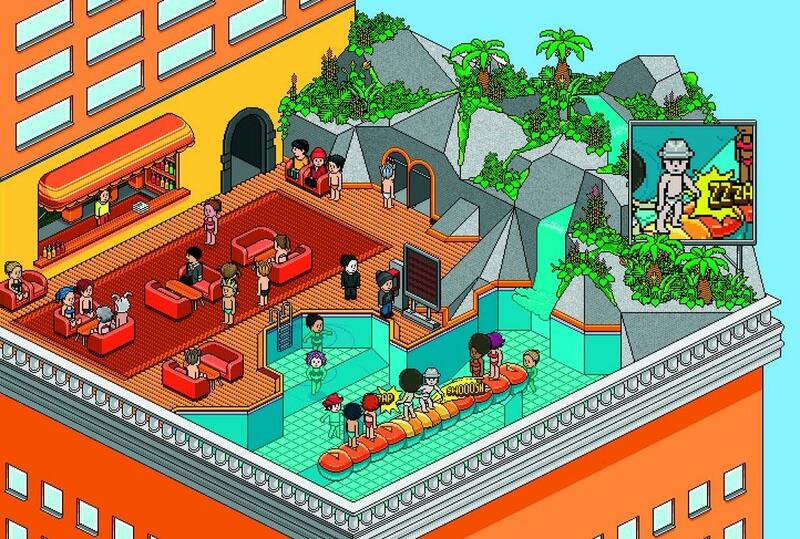 This is what Habbo Hotel is: a voxel-based virtual world simulator that you can play using only your email account or your Facebook ID, and through your favorite browser. One thing about voxel games: what they lack in graphics quality, they more than make up for it with the speed in which they load. Other virtual world simulators load a little bit slower than this little piece of wonder, but with this, you can be up and ready to experience its offerings in just a few seconds after loading the game by visiting its website. Create your avatar by choosing from a variety of options for hair color, skin tone, shirt color and a set of lower body clothing including sandals and trousers. Once you’re done, click on “I’m ready” and you’re all set! 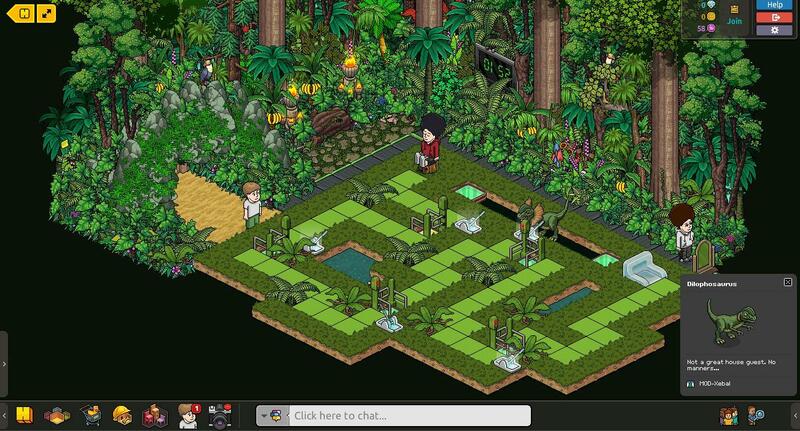 When you’re a beginner in Habbo Hotel, you’ll find your character escorted to your personal room. You can choose from three preset designs. Consider it a bare-bones room that you can furnish later on. Your concierge, Frank, will give you gifts, at least at the starting days of your adventure in the virtual world, including pets and furnishings you can place on your room. Every day, each time you log in, you will receive gifts that will then go to your inventory. To use those gifts and place them to your room, simply click on the Inventory tab at the bottom left corner of the screen. Click on the item, click Use and it’s ready to be used as a décor. When you have nothing to do in your room, feel free to visit other public rooms. These rooms are the essence of the game’s nature as a virtual world. In these rooms, you can interact with your fellow virtual worlders through the Chat function. It’s at the center part of the bottom of the screen. 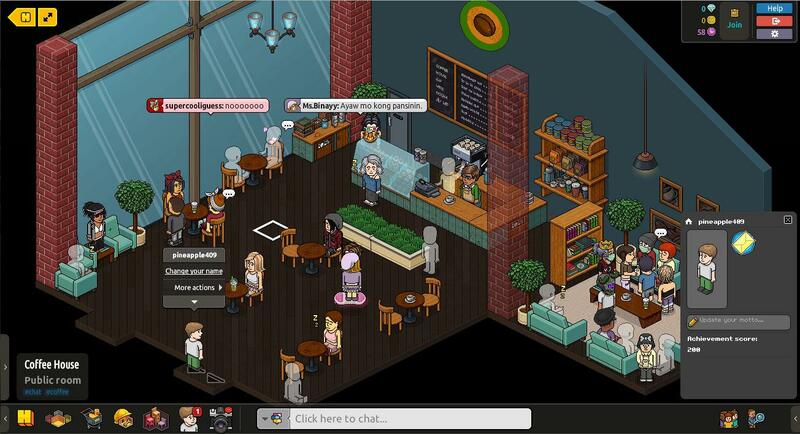 Feel free to chat and talk with everyone; being friendly is a must when you’re playing virtual worlds like this one. Some rooms are Game Rooms: by clicking on a game console in the room, you’ll be taken to a user-created game. One’s imagination is the only limit here: there’s even a game that’s themed around Jurassic Park, complete with prehistoric jungles and a moving Dilophosaurus. You know, the frilled one that spat poison in the first movie. One day is not enough to learn the ropes of Habbo Hotel, so you could find yourself repeatedly coming back again and again to unlock more of its features. You’ll certainly look forward to the pets that Frank will be giving you each time you log in! Simply visit the virtual world’s official website, sign up for a unique account, and start exploring!